Happy Boston Fashion Week! What will possibly be the most hectic few days of my life kicks off this evening with an opening night gala, followed by my runway debut. Yup, you heard me right. 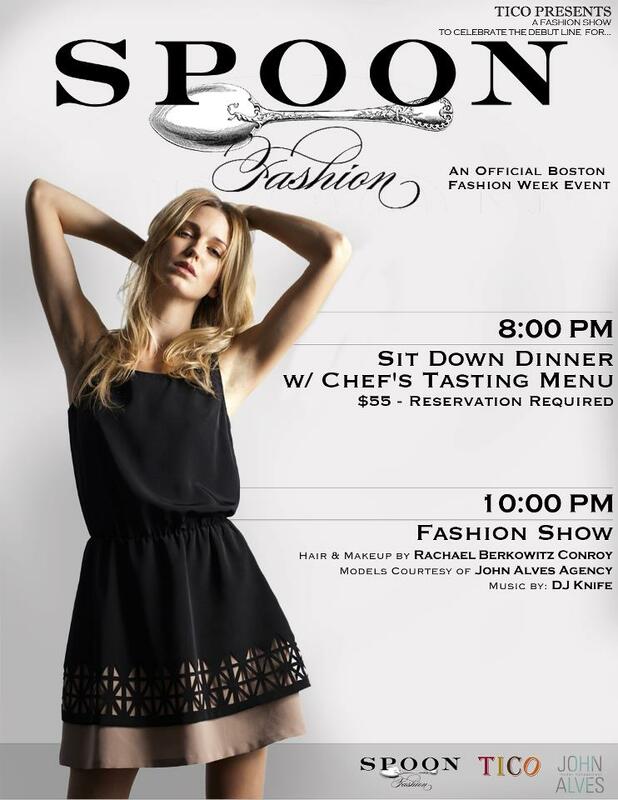 I've somehow been roped into walking the runway tonight at Tico in an outfit I've styled featuring Spoon's Kate top. Needless to say, I'm a nervous wreck. Come show your support as I ungracefully tumble down the runway, and (more importantly!) view Spoon's Spring 2013 collection. For those who can't make it, you can expect a full recap tomorrow, including the details of my first runway styling experiment. And be sure to check back on Sunday when I'll be reporting live from the shows as the official blogger of The Tent at Boston Fashion Week. I'm honored to be sharing the title with Martini Severin of Beyond Boston Chic (covering tonight), Kristen Uekermann of The Boston Fashionista (Friday) and Sarah McManus of Boston Stylista (Saturday). Now I'm off to load up on the pre-Fashion Week essentials of vitamin C and blister block. Wish me luck, and be sure to say hi if you see me out and about! Congratulations! I'm fighting off a nasty cold and not certain I will make it out tonight, but I know you will be great. I can't wait to see your coverage of the events! Thanks, Holls! Get some rest (and Zicam) so that I can hopefully see you out this weekend! Times like these make me extra super duper sad that I live so far out of Boston. I will only be there in spirit, but I KNOW you're going to be a great model! Aww... I'll miss you but totally understand! On any other night, I'd be at home in my pjs. Love you! How exciting!!!! You're going to amazing when you walk the runway, just know it! Please do share some photos with us or at least tweet some backstage snaps if you can!!! I've gone ahead and included a link back to your blog from one of my clients requesting it. I've used your blog URL: http://www. where your hyperlink has been placed, please e-mail me at: katiabeaulieu@aol. I'm really loving the theme/design of your blog. Do you ever run into any internet browser compatibility issues? A handful of my blog visitors have complained about my blog not working correctly in Explorer but looks great in Safari. Do you have any ideas to help fix this problem? Hey! I was curious to know if setting up a blog such your own: http://www. blogger.com/comment.g?blogID=1874433120989362064&postID=7561013663549499902 is hard to do for inexperienced people? be using? I'm new to running a blog and have been thinking about using the Quizilla platform. Do you think this is a good foundation to start with? I would be very grateful if I could ask you some questions through email so I can learn a bit more prior to getting started. When you have some free time, please contact me at: elvinlowell@yahoo.de. Thanks! topic nevertheless I just needed to ask. Appreciate it! I as well am an aspiring blog blogger but I'm still new to everything. Do you have any tips for novice blog writers? I'd certainly appreciate it. simple, yet effective. A lot of times it's hard to get that "perfect balance" between usability and visual appearance. I must say that you've done a fantastic job with this. Your blog, "Blogger: The Well-Appointed Catwalk" and mine are very similar. I've loaded your site in 3 totally different web browsers and I must say this blog loads a lot quicker then most. Would you mind contacting me the company name of your website hosting company? My personal email is: laurencesteen@bigstring.com. I will even sign up through your own affiliate link if you would like. Appreciate it, e.g. Go At this site ()! that I extremely loved the standard info an individual provide to your guests? had issues with hackers and I'm looking at options for another platform. I would be awesome if you could point me in the direction of a good platform. I'd really like to be a part of online community where I can get advice from other experienced people that share the same interest. If you have any recommendations, please let me know. Thanks! Exactly how do I go about acquiring one of these for the website I'm building? Thanks! their iPad is jailbroken. Will the screen size be between five" and seven"
and how a lot will it cost? Depart iTunes running and by no means contact it as soon as again.